Kinver Freeliners AC control the Staffordshire & Worcestershire Canal below Stewponey Bridge, which is near Stourton in Staffordshire. Stewponey has 100 pegs from Stewponey bridge (A449 Wolverhampton to Kidderminster road) to Hyde Lock just outside the village of Kinver. 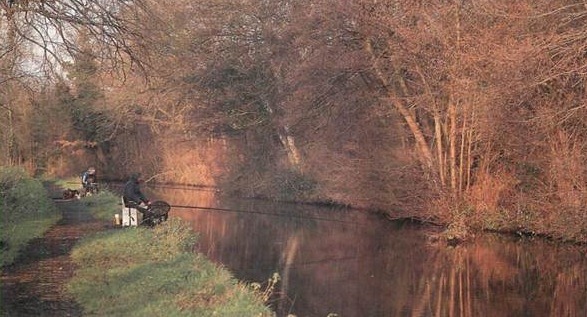 This stretch offers superb fishing for the matchman and pleasure angler alike. With its almost unbroken line of overhanging far bank trees, virtually every swim below Stewponey Bridge looks the part at first glance. Surely, then, it doesn’t matter much which one you choose to get stuck into the resident gudgeon and roach? Walk the towpath and take a second, closer look, and you begin to see that some swims are more equal than others. The first few pegs below Stewponey Bridge, the canal widens out into a bay on the towpath side here, making this a good spot for gudgeon holed up at the bottom of the inside shelf, away from the main flow which is towards the far bank. 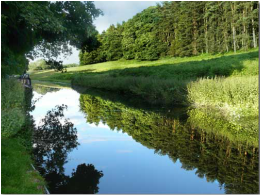 The tree-lined Staffs & Worcs Canal below Stewponey Bridge (above) looks uniformly fishy, but you must pick the right peg. The chap in the foreground is on the noted tree-stump peg. The towpath is wide and flat all along this stretch, giving you plenty of room to lay your tackle out without any danger of passers-by treading on it. In summer, when boat traffic is very heavy, roach take up residence under whatever far bank cover they can find. But before you choose a peg, look carefully to make sure the vegetation is not just overhanging the surface without actually going down into it. It must dangle right down into the water. It can take time for a swim to respond, so sit patiently and quietly so you don’t scare the fish. Day tickets can be bought on the bank from Kinver Freeliners Angling Club patrolling bailiff. To get there, turn off the A449 on to the A458 opposite the Stewponey & Foley Arms and park in the road by the bridge.